When your research calls for speaking to the same participants at multiple time points, you need to quickly and easily identify the phase at which each interview belongs. This is where dynamic descriptor fields come in. In addition to sounding cool—‘dynamic,’ ‘ooooooh’—this mixed methods component of Dedoose increases research efficiency and effectiveness by helping you quickly visualize, organize, and identify aspects of your data that expose variation across time. For example, how qualitative responses change as a function of the pre/post phase of an experimental study or chronological shift in a multi-time point longitudinal project. Without further ado let’s dive in. Typical Descriptors are static and are the spreadsheet like data that consist of the demographic, survey, rating, and other quantitative types of data characterizing the SOURCE of your interviews or other qualitative data—ex. ID, name, gender, ethnicity, depression score, income group, etc. of a research participant. By incorporating these types of data, you can run filters, sort, and pull up visualizations that show you how codes, for example, have been applied in ways unique to a particular gender, from a particular zip code, and so on. This mixed methods approach opens up a world of powerful insights that cannot be seen from a purely qualitative data approach alone. 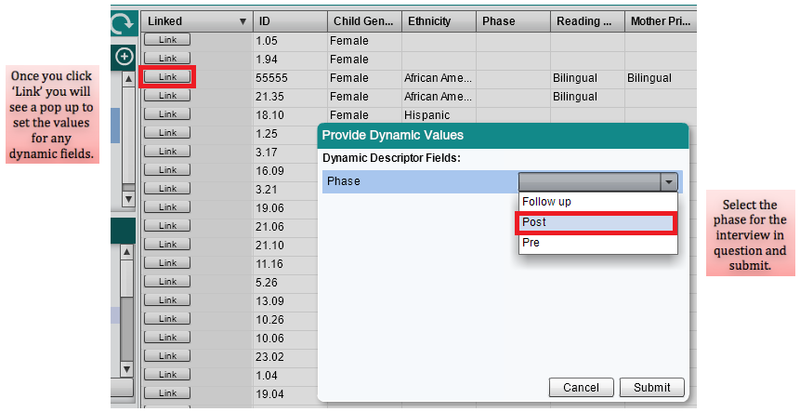 Dynamic descriptors are best used sparingly, and only when there will be distinct time points in study and where analyzing variation in the qualitative data being collected as a function of time will be important to addressing research questions. This is why for Dynamic descriptor fields we recommend using simple labels such as ‘phase,’ ‘year,’ ‘term,’ etc. as an option list field type with values like ‘pre-intervention/post-intervention’ or ‘time 1/time 2 …time n.’ As with all descriptors, the ‘field’ can be thought of as the ‘question you are asking.’ But with Dynamic descriptors this question addresses time points and not participant characteristics—ex. ‘In what phase of the study is this interview (or other qualitative data) from?’ The options, or answers to the question, will be the values that correspond to the number of phases that you have in your study. So, the field might be titled ‘Phase’ and the option list choices would be ‘Phase 1/Phase 2 and so on. In other words, say you interview Ms. Dee Doose on two occasions. On the first occasion she will be female, 5’2”, of Asian heritage … and the interview will have taken place in Phase One of the study. In the second interview, Ms. Dee Doose will still be female, 5’2”, Asian (most of the time of course), but you will now be in Phase TWO of the study. When you upload her second interview the demographics such as gender and ethnicity will not be different, but the phase of the study will be. By using a dynamic descriptor field for the field labeled ‘Phase’ you will be prompted to select the phase to which the interview belongs when you link the document to the standard static descriptor data for that participant. Let’s bring this example to life. In the demo data, there is a field titled ‘Phase.’ Let’s assume this demo project was an intervention study and you will have three interviews (pre, during, post). 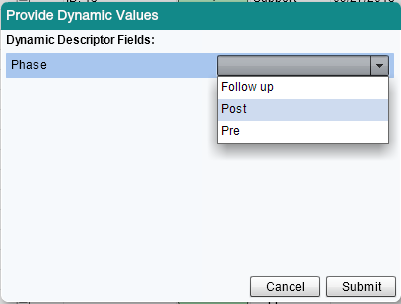 You would create a field called ‘Phase’ and click the box at the bottom left to make it a dynamic descriptor. Go to your demo project’s Descriptor Workspace to explore further. From time to time, a user will email us explaining that they made ALL of their descriptors dynamic and then find themselves with quite a mess to clean up. Don’t let messy descriptor data happen to you! Rather, take the time to think through what may change at known time points in your study. What change do I want to track for my analysis and then create a dynamic descriptor for that just those aspects of the study (usually only one or a small number of such fields). Research projects can, indeed, consist of very complex designs and, subsequently, involve equally complex databases. As always, we are here to help you better understand the use of descriptors and how both static and dynamic can help in your work. Descriptors are tough for many qualitative researchers to wrap their heads around when they first start bringing mixed methods elements to their work. Email us anytime at [email protected] and as always follow us on Twitter and ‘Like’ us on Facebook to stay on top of Dedoose developments. What is it about descriptors that you find most helpful in your project? What is most frustrating? Leave a comment below.